The owner of River-Tech Co.,LTD is a OB of sheet metal machine manufacturer Amada Co., LTD. Since 1989 establishment of the company, we have dealt around 200 machines a year for the last 20 years and more than thousands of them since the establishment. Used Sheet Metal Machines’ value are not same even they are made in the same year and by same manufacturer. The value depends on how often they were used and whether they were maintained or not. As for purchase and sale, careful consideration, knowledge, and experience are needed to figure out the value. Since our company has had lots of business performances, been trusted by domestic and foreign users and trading company, and dealt variety of sheet metal and metal cutting machines whatever they are new or used. 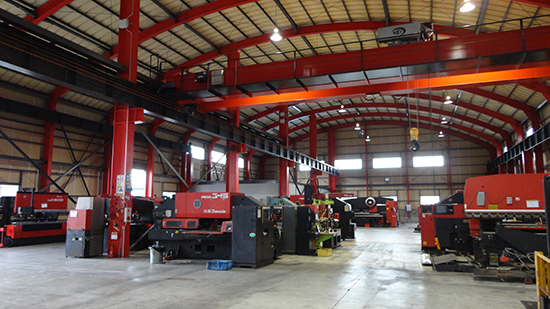 In 2006 our company moved to the new office which has 2 overhead traveling cranes and 300 square meters warehouse near Higashi Osaka Kikai Danchi. Working environment for painting and maintaining machines were prepared and the warehouse also has played a role of an exhibition hall and a large number of customers from domestic and foreign have visited us to see our actual machines. The trend of the industry of domestic and foreign “Purchase and sale of used sheet metal machine” has been changed and expanded together mainly with development of Asian countries which has grown economy. Especially the demand from recent Asia is almost same as the one from Japanese users. It is true that stocking and selling actions of newer and better machines are getting more aggressive year by year. River-Tech works with the priority of making the best use of all the information network and stocking machines which are used until just before at users’ factories. Almost all the machines which you may see on pictures and videos when we have a business talk are currently working, We are proud that customers those who come from far would also feel at ease to purchase. The customer’s trust will encourage River-Tech for the future. From JR ShinOsaka St. ride to Honmachi St. by Midosuji Line and transfer to Chuo Line bounding to Ikoma and get off at Aramoto St. 10 mins walk from Aramoto St.
Ride on Harshin Kosoku(High way) 13 Higashi Osaka Line and get out at Higashi Osaka Aramoto (13-06) and head to Route 308. Average about 40 cars are displayed. It is opened up at any time for touring.